Could the tragic loss of this young San Antonio man have been prevented and are justice and compensation available to Terrence Scott’s family? 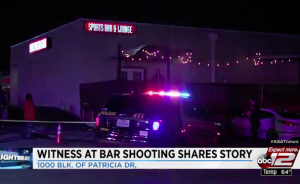 Security measures are in question after a San Antonio sports bar shooting claimed the life of 26-year-old Terrence Lamont Scott and left a woman injured early Saturday morning, November 17, 2018. According to KENS 5, gunfire erupted inside “Chasers Sports Bar & Lounge, near Blanco and West Avenue around 1 a.m.” Mr. Scott was discovered with fatal injuries at the scene. A female victim was transported to the hospital with injuries. Her identity and current condition have not been released. A witness reportedly told KSAT 12, he “knew something was going to happen because there was no like, no security whatsoever. They were just letting people going in. I mean the place was packed. Like something was bound to happen.” The chaotic account raises grave questions over security measures at the bar. Have there been prior incidents of criminal activity on or near property? How did a gun gain entry to the property? What security measures, such as weapons screenings, metal detectors, bag checks, surveillance cameras, and visible security personnel were in place to deter crime and protect Mr. Scott at the time of the shooting? Generally, property owners are required to protect all those legally on the premises from any foreseeable harm. Should the facts of this matter reveal that the sports bar owner failed to provide adequate security to protect those on its premises, Terrence Scott’s family may seek justice and elect to pursue legal claims for their loss. Additionally, the surviving victim of this shooting may pursue legal claims for her injuries.